I’m going to detail the living room furniture next because I carried the same fabric from the kitchen into the living room and it seems like the most logical transition. I’m actually already elbow deep into a side project at the moment as some new materials for my store have just arrived via eBay and I thought that I’d be finished with it last night but I started watching a foreign film with subtitles and my eyeballs got sucked in the wrong direction. 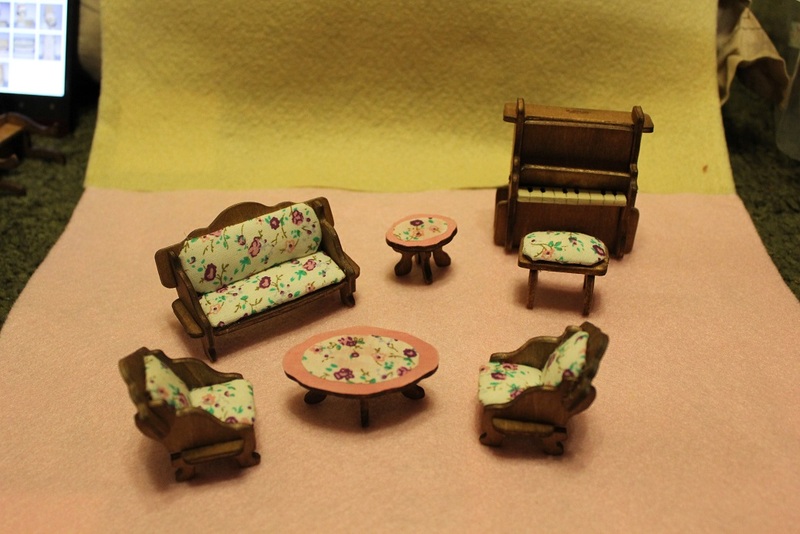 Anyhoo, here are the before and after summaries for the living room pieces! 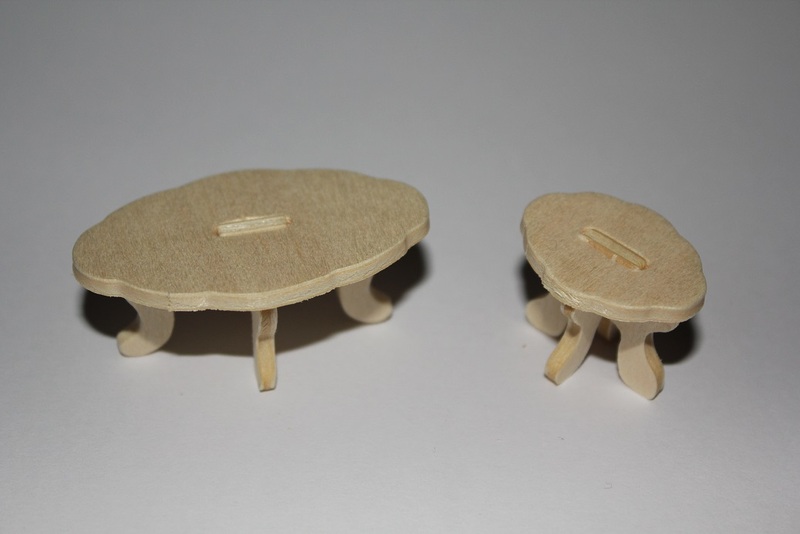 The set came with two little side tables which both have a dent in the center where the legs fix on. The first thing that I did was take care of the dent. As with the other pieces that had a similar issue I used polymer clay and then baked and sanded it. This method was not the greatest and if I did it again I’d just use glue to fill the hole and make a smooth surface. Having the ugly bit in the middle of the tables meant that I needed to cover them somehow so I stained everything but the table tops then glued them all together. Next, as with the dining table I just glued a rectangle to the top with a thin coat of craft PVA and allowed it to dry before trimming the edges. 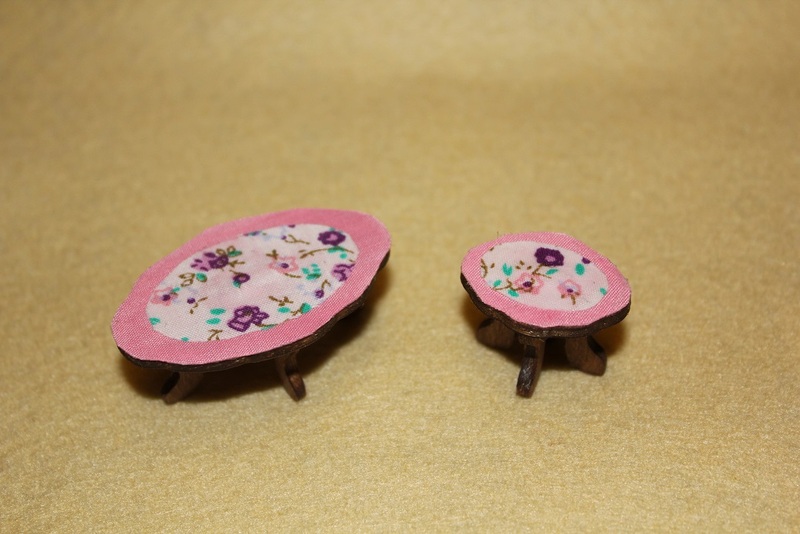 The pink fabric was quite pale on its own so I used two layers of pink and then stuck an oval of patterned fabric on top of each so that they weren’t just screaming pink. I could have done with only the patterned fabric but I wanted to be a bit fancy so there it is. 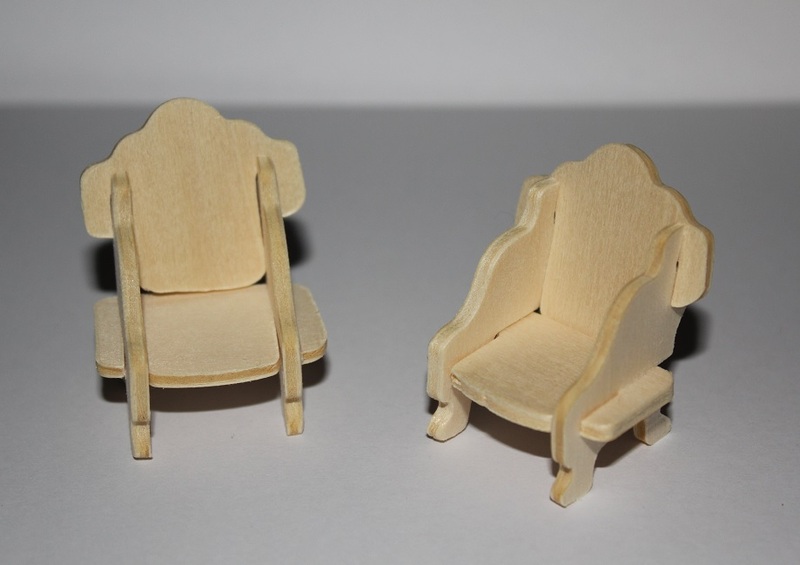 The chairs were stained in pieces then glued together and the cushions were glued on. Very straight forward! The sofa was exactly the same as the chairs except I had to make different shaped cushions. The Piano was my favorite part and it was the most annoying piece of furniture in the whole set to assemble, especially with the slight wood swelling after it was stained. But I persevered! 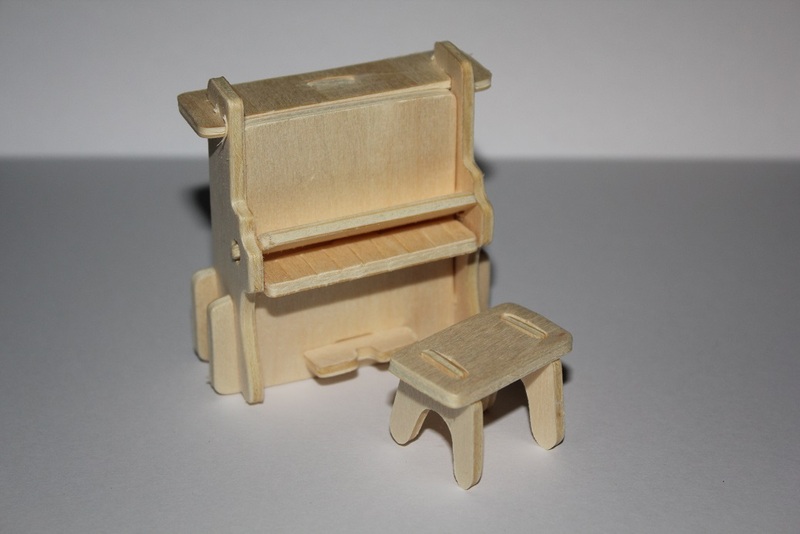 I managed to force it together and it fit so snugly that the only bit requiring glue were the keys and the foot peddle. I love that it had a little flip up lid too. I stained all of the piano and stool pieces except for the keys and then I put them together. The stool did require gluing as well because it was quite loose. The keys piece was slightly crooked so that if you put the lid down you could really tell because there was a bit sticking out so I had to sand it square but after I sorted that out it looked perfect. I painted the keys in the same shade of white (parchment) that I carried through from the kitchen and the bathroom and I painted on the little black keys to make it more piano-ish. The last thing I had to do was define the keys with a pencil. There are tiny indentations on the top suggesting where the keys go but once they’re painted you sort of lose that definition so I just went over them with a pencil and carried the line though the front. Then I glued the keys into their spot. Ideally I wanted to leave the stool cushion-less but as with the tables it had dents in the top from the tongue and groove fittings so I needed to cover it somehow and since it was a seat I made a tiny cushion for it. And that’s all of the pieces reviewed.